A3. Are Y'All Fired Up? Just about a year after Malente's remixalbum "Rip It Up" on Unique Records and a variety of 12'' singles on fine labels such as Moonboutique, Luscious Sounds and Splank! 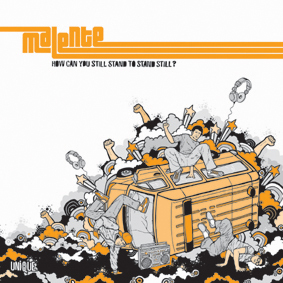 - not to forget the other two recent unique singles "Dancefloor Whore" & "Like A Freek" - Malente is ready to rock, roll and kick of the campaign to his fourth overall album entitled "How Can You Still Stand To Stand Still?". Artistically, Malente remains true to his principles and travels through 70s & 80s Funk, Electro and Breakbeats but sounding more electronic and powerful ever since. The album offers tracks and songs for any occasion, starting with classic vocal single repertoire such as "For The Revolution" - by the way the first single which comes across with remixes from DJ Regal, dutch rhythm master Mason and UK's Smoove - and "Open Secret". Then there's bloody electro breaks madness such as "Like A Freek", "Move Your Body" and "In The Sky" which has been produced with his friend and partner Lars Moston. "In The Sky" has also been released in a different version as Moston & Malente on Moonbootique!